This construction client's manual is written in the form of a list of activities. It supports owners in the role of client by helping them make choices during the project development process. This increases control over cost, quality and duration at each stage. Activities within each main stage of the project development (preparation stage; procurement; design; preparation for construction; construction itself; handover; implementation) are divided into phases, each requiring separate decision-making. The phase begins with a list of direct previous decisions and continues with a list of executors, the goal of the present phase and a list of activities to be performed. And each phase ends with a list of expected results and a list of activities that these results release for action in the next phase. The sequence of these seven stages can be altered to help building owners manage risk by choosing and combining the timing of these stages. The tasks involved in project preparation, described in the first chapter are for example, often left by the owner for the designers to solve - or sometimes even the contractors. The decisions relating to the choice of procurement schemes, described in the second chapter, can be made either at the preparation stage of project development, as part of the prioritisation of aims, or at the time of choosing the designer, or at the stage of choosing construction contractors. 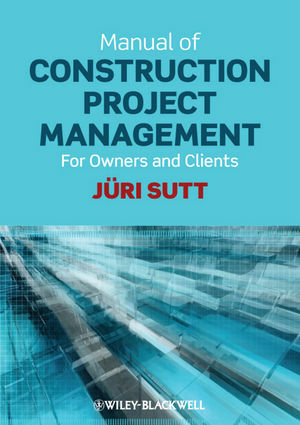 Manual of Construction Project Management – for owners & clients is for prospective owners who either operate as clients themselves, or who use the services of professional construction management companies. The aim is to help both owners and their construction partners understand what to expect from each other. The manual describes activities at the level of detail required to choose the management task or method to make the decision. It is not bound to regulations of any specific country and a detailed glossary makes it an indispensable worldwide reference. Jüri Sutt, Professor of Construction Economics and Management at the Tallinn University of Technology has 50 years of experience in construction management as a practicing responsible for building during Estonia’s transition to a free market economy and led working groups on construction market regulations. He has also provided consultancy services for clients’ projects and contract management and has gained expertise in contract disputes over the last 15 years.